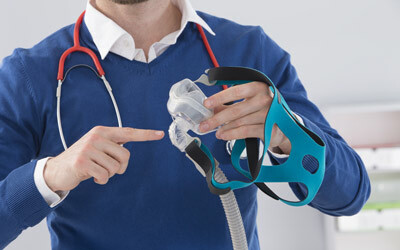 Having the proper fitted mask is important when using a CPAP and often one of the most common problems when it comes to issues with your CPAP. Without a proper fit you are not getting the positive air pressure you need to ensure you get the best sleep without complications. One of the scariest complications of sleep apnea and an improperly fit mask is that you stop breathing in your sleep and do not start breathing again. That is the object of the CPAP to make sure that you continue to breathe during sleep. Getting the proper fit depends on several things, the size of your face, the type of mask you wish to use, and the way you sleep. The size of your face matters especially with the type of mask you choose to use. If you have long face and square jaw or short face and rounded jaw the mask will fit differently. It is important not to over tighten your mask. Once you have the straps adjusted, instead of loosening the straps to take your mask off; unhook one or both sides to remove your mask so that the adjustments in the straps. It is actually best to get your mask fitted by your respiratory therapist that the doctor ordered your CPAP through, or the medical supply company where you got your mask. Both are trained in fitting masks and explaining proper adjustments with the straps. The way you sleep will also depend on how you sleep. If you are a side sleeper, sleep on your back, or change positions several times a night. Side sleepers need a mask that will not be pushed into their face. People who switch position often through the night need a mask that will not slip off or come loose. The reason a proper fit mask is so important is so that it does not slip off in the night when you change positions, or you take it off yourself because it is uncomfortable. It also reduces the chance of leaks. If your mask is not fit properly it can cause leaks which means you are not getting the right amount of air pressure while sleeping and it could blow air into your eyes and dry them out. A properly fit mask will make sure that you get a good night’s sleep without causing skin issues or drying out your eyes. You should make sure that your facial stubble is not causing the leak. With a full face mask it is easier to keep a good fit if you are clean shaven. The proper mask fit is essential for a good night’s sleep without complications. It makes sure you that you get the air pressure your Toronto doctor and respiratory therapist recommends.